I won't be adding any new courses right now, I'm going to try and start adding more detail to the existing ones first. New boat hulls are in the plans, but this is just a hobby for me and I only have so much time to work on things. That's up to whoever is running the league. With the current water library I'm using, wake effects don't affect the boat physics, but I can adjust how rough the water is for the entire course. I'm planning, in the future, to switch over to the Crest Ocean library which supports interactive wakes and other interactive water features. I've done some quick tests with it and reported some bugs to the dev. It's in pretty active development, so I'm waiting for some bugs to be worked out before I put in a full effort to switch to it. Right now I've started working on some 3D models for the pit areas. Unfortunately, I've been really busy with work and taking care of a baby, so I haven't been able to get anything done the past couple weeks. Support for metallic / smoothness maps and added default metallic maps. Added U-1918 Oberto with metallic maps. Added U-9 Les Schwab with metallic maps. U-100 Leland and U-9 Jones teams. Flame animation slowing down in replay. 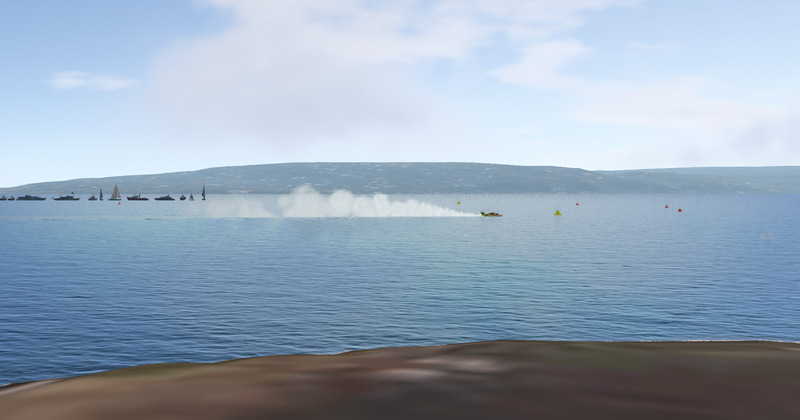 Attemping to fix hovering/sinking buoys again. @Mickey Thanks Mickey, that's awesome, I love the intro! It seems I introduced some worse bugs in the last patch. In the meantime, the server is currently running 0.5.3.0. There's a new update up with some bug fixes. Bugs with drivers not showing up in the results and laps not counting. Bug causing laps to not count on server. Potentially fixed other bugs introduced in last patch, needs testing. Bug with admin menu not being editable after hiding it or going out on the course. Bug where re-joining the server was adding duplicate drivers. Rule changes don't take affect until the session changes or is restarted. Fly camera mouse look is disabled by default, can be enabled with End key. Added ability to configure the key bindings for the above inputs and some others.